Last fall (2015) we began looking at some updates for the Hok skis. They have remained unchanged since their introduction in 2011. 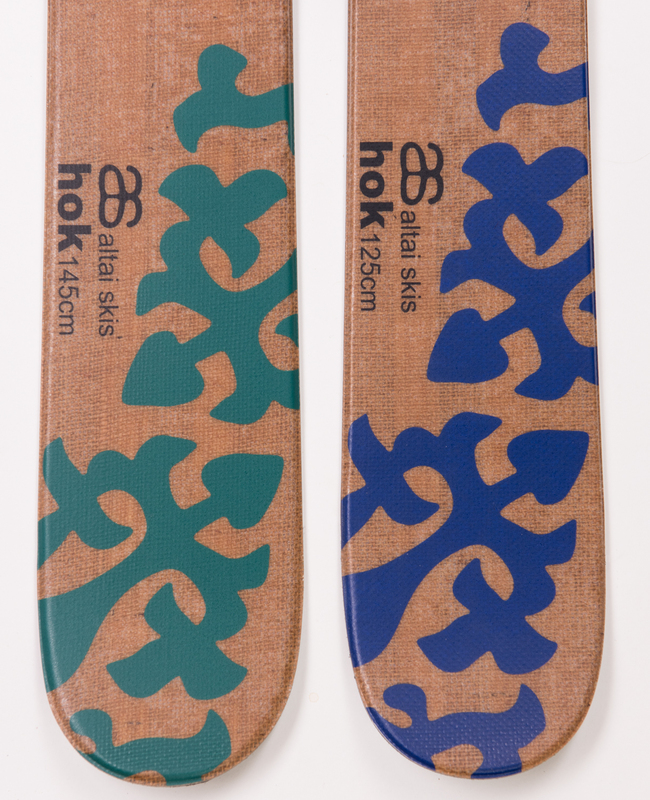 Our initial change was in the skin design, the business part of the base and what really defines the Hoks as a new and different way to ski. 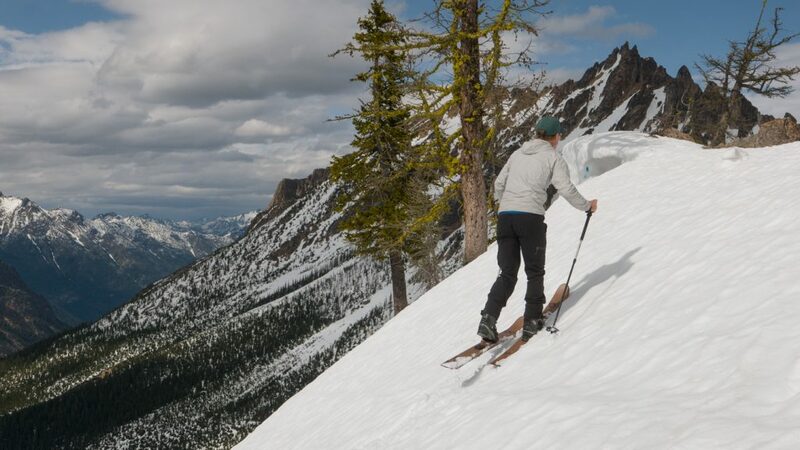 The skin material – the same used in many backcountry climbing skins – is costly and not to be wasted. We worked on a design we used with the Balla Hok that allows us to nest one piece into the next. We built 10 pairs last year and tested them in all manners of snow from January on to see how the performance compared to our old design. Our goal was to equal or exceed the performance we had with the old design, and we succeeded! After that we felt it would be a good time to (slightly) update the graphics so we could differentiate old from new. We love our graphics and look, and are quite keen on not changing graphics every year as is the norm these days. We felt a change in design was a reason to update the look. We kept the jute (burlap) layer in the top sheet (it’s real and does have a structural component) and it is quite unique and distinctive. Below are the changes to the Hoks. The 125 and 145 Hoks have a new skin shape. 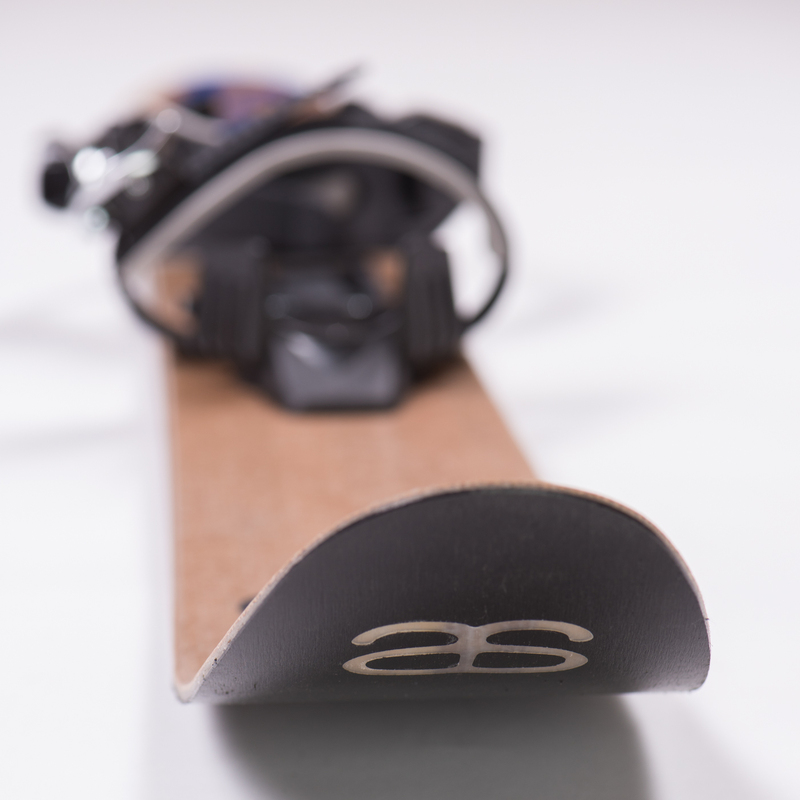 We did this to reduce waste on the skin material, testing the new shape for most of last season. Our goal wast meet or exceed performance of the previous shape while allowing us to reduce the waste of this material. We succeeded in this! In changing the skin design we felt it was a good time to change the graphics a bit. 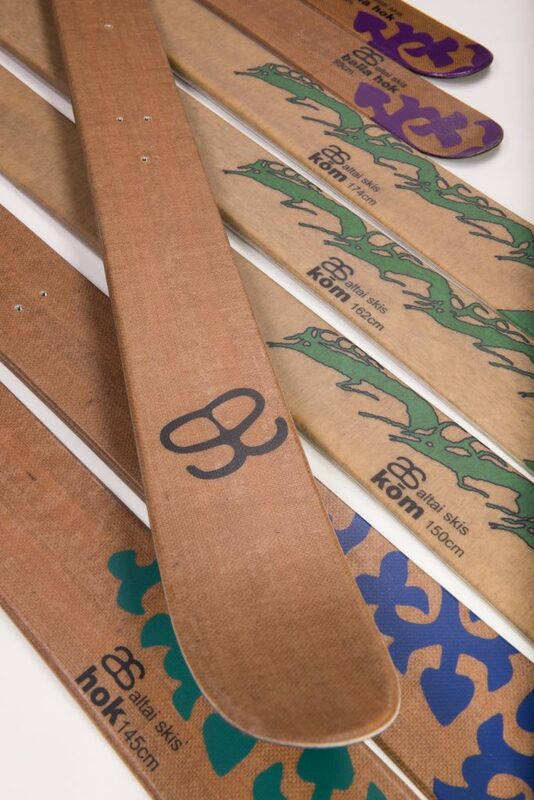 We kept the same theme but changed colors on the tail design and gave each size its own color on the graphic detail. We now have a Hok family. We also added a tip logo on the base that is inset into the black ptex. This is done with clear ptex so you can see the wood core through the logo. We like it! We changed the mounting point on the 145 cm Hok, moving it back 3 cm (about 1 1/4 inches). Several users have asked about the forward position, and we have been testing this for a while. The forward position of the mounting gives the Hoks a easier to maneuver factor, as well as makes them break trail better in deep snow. For non skiers it is easier to have a long thing attached to your foot following you then one leading the way… :-). Many of us as well as our users are finding the 145 to be a fun tool to really go out and explore/ski in more adventuresome terrain. In pushing the mounting point of the 145 back, we are pushing the 145 a little further toward “ski” on the ski to snowshoe continuum. 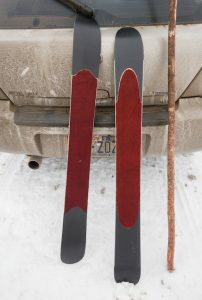 Finally, we also changed a layer of fiberglass in the 145 to make the ski about 7% stiffer overall. 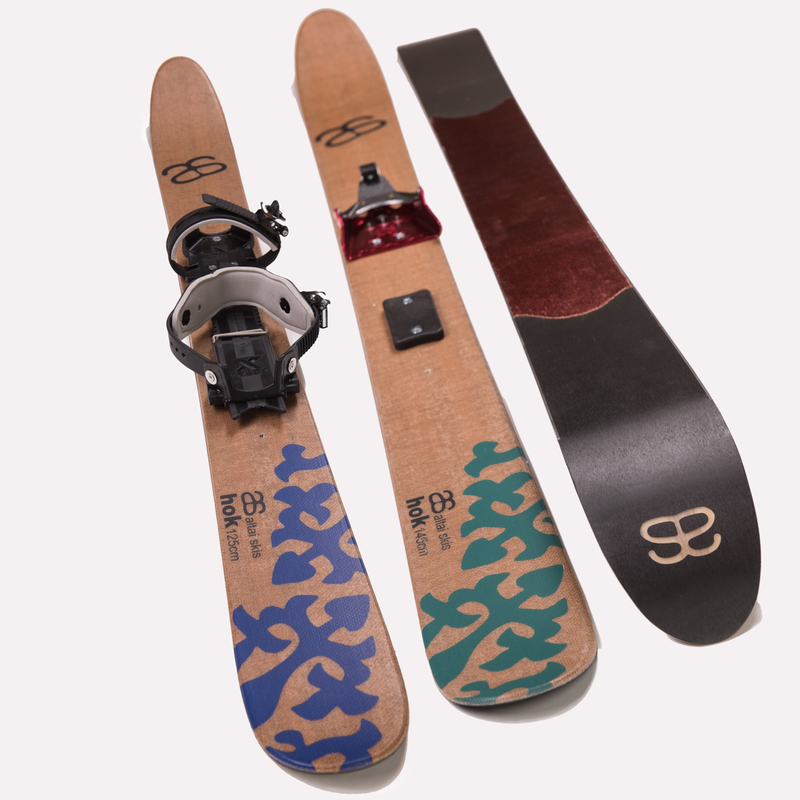 This gives the ski a bit better floatation for big guys (breaking trail or skiing) and also make the 145 a bit more sturdy skiing at higher speeds.